THQ's uDraw is a peripheral unlike any before it, and it's coming out this year. If you haven't heard of THQ's uDraw, listen up because it has the potential to be a sleeper hit this holiday season. 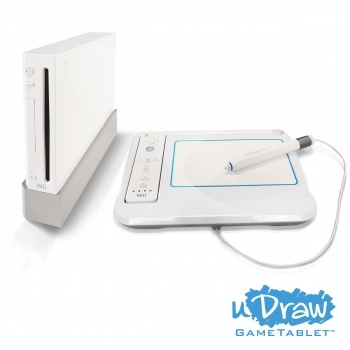 uDraw is a drawing tablet peripheral for the Nintendo Wii revealed in August and was once scheduled for release in 2011. THQ recently announced that it's coming out this year instead. uDraw is basically Microsoft Paint for the Wii, but it has it's own wireless tablet and pen. Using various tools like stamps and line editors, users can create almost anything they want and export their images on an SD card. Each creation can even be played back in a replay mode to show people how it was made through each stroke. The uDraw tablet comes bundled with uDraw Studio, but two actual games will launch right alongside it. Dood's Big Adventure and Pictionary will not only use the uDraw tablet, but they'll require it, with more titles planned for 2011. Pictionary is self-explanatory, but Dood's Big Adventure speaks to the potential of the device as a platformer that has players using the tablet to create objects and attack enemies. uDraw will be released on November 14, 2010 for $69.99, which is not a bad price for a drawing tablet that can also play games. It's yet another unique addition to the Wii's accessory library that should enable people to play new kinds of titles, and who knows what kinds of mods people will create by hacking into it. These types of things tend to fly off of retail shelves, so if you want one this holiday season, you probably should pre-order. I only have one question... Will this work with Okami? A Wii graphics tablet? really? I mean, I'm sure it could be fun, but come on. Even for someone who likes the Wii this seems a bit much. Still, a rather peculiar idea. Seems like something 5th Cell would come up with. It'd make Drawn to Life a helluva lot easier. Now Nintendo is out of excuses for not bringing Mario Paint to the Wii. WHOOOOOOA! ....THQ is still in business? If they don't do some sort of sequel, or remake it so that it can be used with is, it would seem that they would then hate money. Well, there's Okamiden coming up. Now I wonder that as well. If the answer is "yes", consider it bought. So it's an iPDad? or one of those drawing thingys for computers? Ninteno is a little late to the party. Anyone else having flash backs to Mario Paint? Am I the only one who thinks this user is too young to remember Mario Paint? I'm kinda interested if I'm honest. I wonder if they'll remake that Art Acadamy programme for the Wii now? I'm betting it would have been modded into a real graphics tablet within a week of release. A tablet peripheral? o: That actually sounds awesome, I want one! This looks really gay boring and pointless. Like your going to sit down and draw really bad pictures on your lap? ...Why not just buy a normal tablet...? Which you can use to draw properly... ? And then publish stuff...? That.... actually sounds like a very good idea. Wow THQ, you've been quiet for a while but this does look actually useful and functional. Bravo. Yes and they publishes STALKER Shadow of Cherobyl AND Metro 2033. TQH have been making quiet money by investing in lower cost economic regions. And Dawn of War don't you know. I suppose something like this was just a matter of time. It is a pretty cheap graphics tablet but I wonder how good it is, it might be pretty basic without any pressure control. Its layout is of course right handed, might cause a bit of awkwardness reaching the wiimote buttons if you're trying to use it with your left hand. It might be ok as long as you don't need to use buttons and the pen at the same time at any point. I'm sure there used to be a fisher price toy that plugged into the tv and did the same thing, at least the found a use for it. And Saint's Row 2 didn't do bad for 'em either. Indeed, just becuase the boss of TQH dosen't wave his balls in the face of gamers (like some CEOs have been doing) dosen't mean thety no longer exist. They have kind of been on the DL making a good number of great games happen. They rarely whip up a hype machine in their own name like EA does so you don't really notice them. There is a fine line between news and advertisement. The latter usually includes empty phrases like "unlike any other (peripheral)". It's just a tablet and probably not a very good one, judging by the price tag. And what's up with stuff like "you should preorder it right away"? I know you get those nifty ~8% per sale, but come on. MS Paint for the Wii? Are publishes even listening to the public? I can see a COLORS Wii edition coming out to go with the DS and Iphone versions, shame you have to become a criminal (In Nintendo's eyes at least) to use it. Question? Can I use this also on my pc?